StemFlo® is the only supplement of its kind, all-natural and scientifically-tested for effectiveness. A cutting-edge blend of antioxidants and enzymes that support optimal circulation, StemFlo was specifically designed to support your inner potential circulation. The supplement also helps to naturally maintain your wellness. StemFlo supports the circulation of the inner potential. Its ingredients are known for their antioxidant function, which can also fight against fibrin. Fibrin, when it accumulates, can disrupt the proper functioning of the circulation. 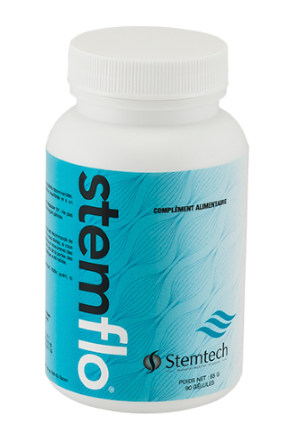 According to Dr. Mira Gadzala, Stemtech’s Senior V.P., Research & Development, "What is unique in the StemFlo formula is the blend of powerful antioxidant and botanical properties, designed to support the optimal circulation of inner potential. The result is that StemFlo optimizes wellness naturally." Stemflo is an important part of daily nutrition and works best when used in tandem with SE3® and MigraStem™.